← We Visit the Barrenlands, by Dogteam! 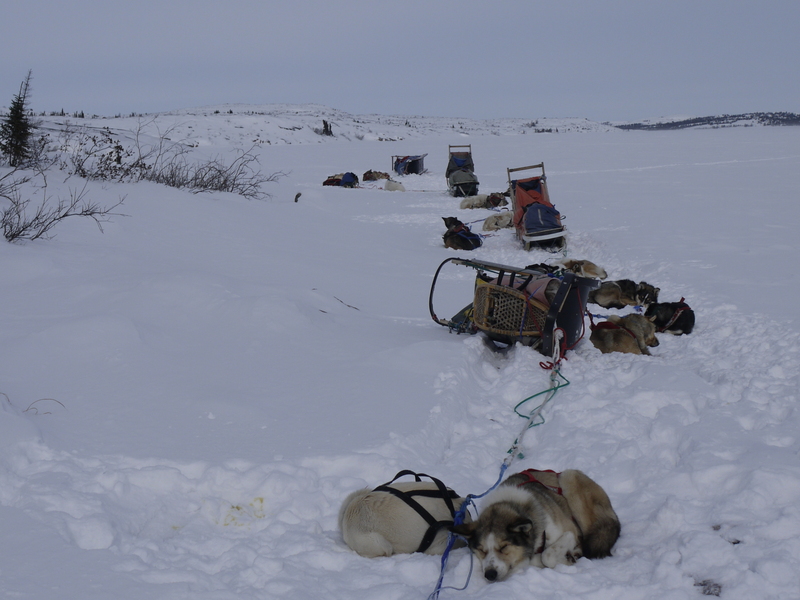 Loaded sled and ready to go! At first our trail, which headed north to the edge of the tree line, consisted of lakes interspersed with portage trails. The portage trails went uphill and then down, and involved winding for some distance through the forest. As we journeyed further north these trails became smaller and flatter, until our journey consisted of traveling in a wide open landscape, on large long lakes, with only small patches of trees in scattered pockets. I can’t decide which I like better – those trails or the open lakes. 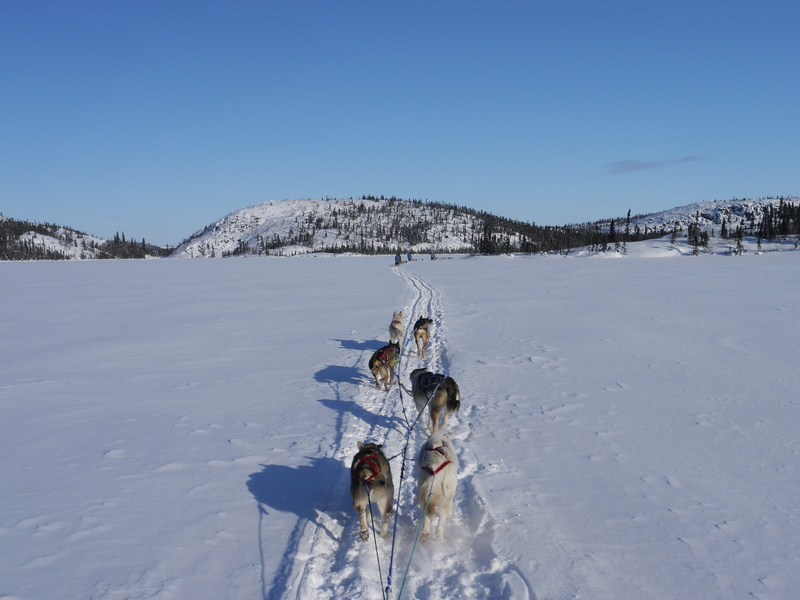 It was really fun, although hard work, to travel on the trails – helping to nudge the sled uphill and running behind the sled to help the dogs going up, and then steering and riding the brake on the downhills – quite a bit like downhill skiing really, although even more fun. The lake travel was not physical, but being in such wide open spaces, in such remote solitude, not speaking or hearing a word for hours at a time, was wonderful. 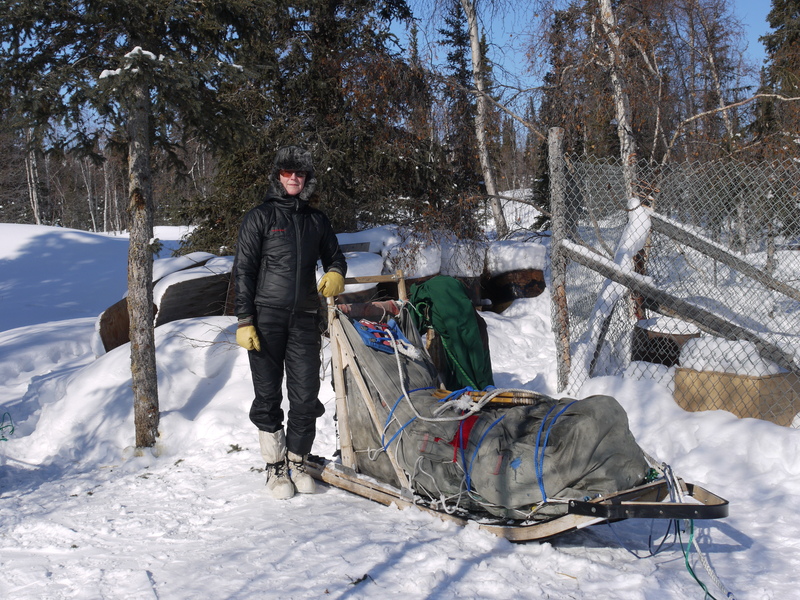 Dave Olesen, our guide, has raced the Iditarod sled dog race some 15 times, and so we heard some great stories of his experiences. 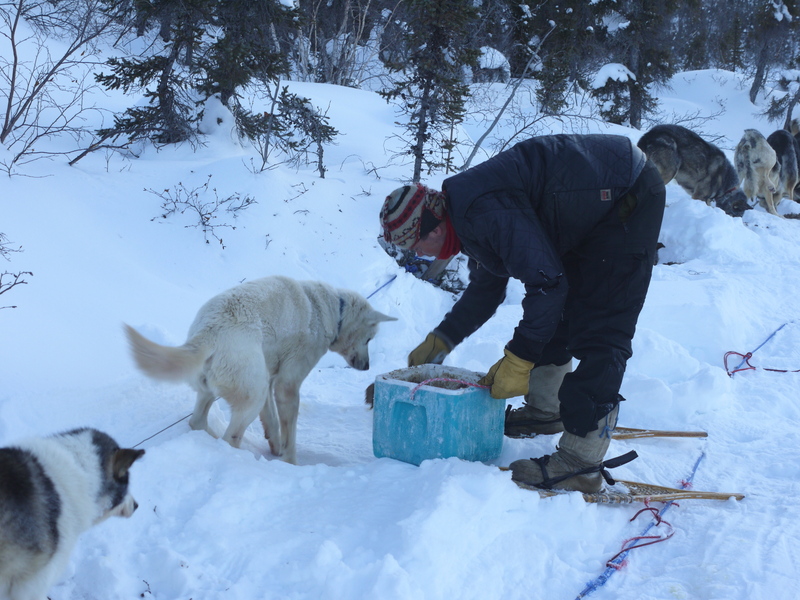 I’ve also read every book I’ve come across on dogsledding. 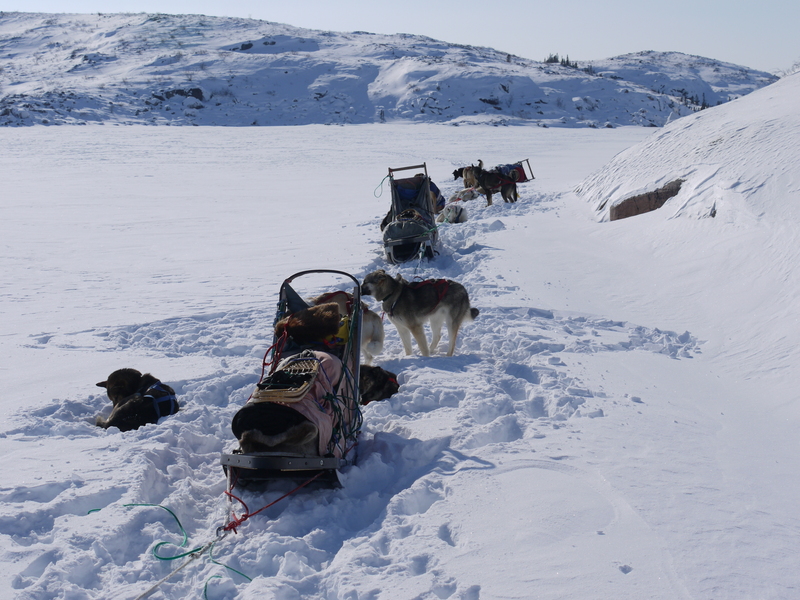 On this trip I felt like a real dog musher, as we encountered conditions I’d heard about but couldn’t really imagine. The long open trail, traveling on a river, hills and forest, and even overflow. 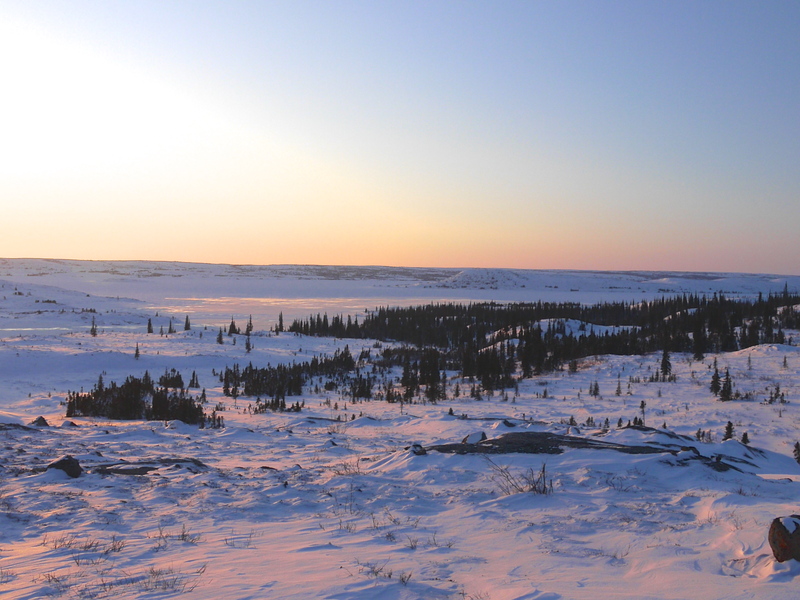 Its hard to imagine that even in a northern winter, with temperatures far below freezing, there is still open water. This of course causes great difficulty if one accidentally encounters it. 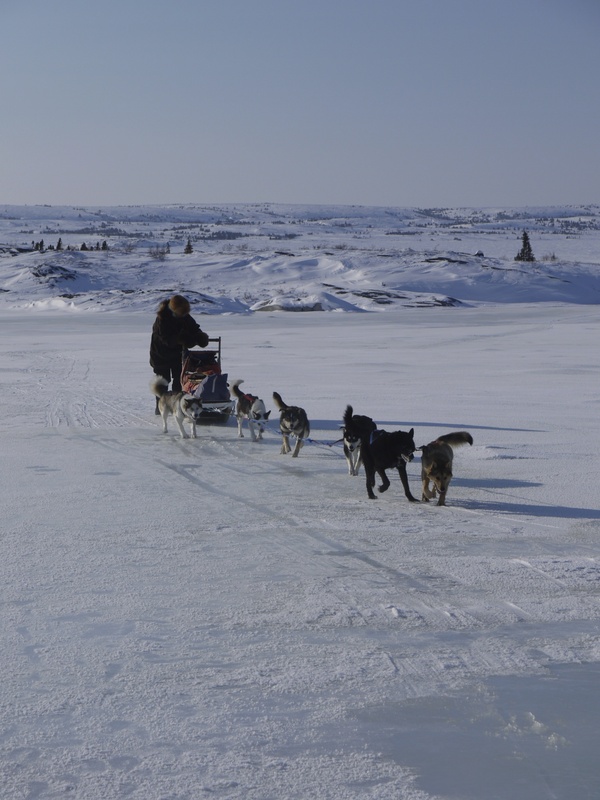 The sled runners take on slush, which fairly quickly freezes. If you can’t get out of it, (if say, for instance, your snow machine gets stuck in it) it will stay there until spring. (You can ask Dave more about this!) It also can fill up your boots, as I discovered! 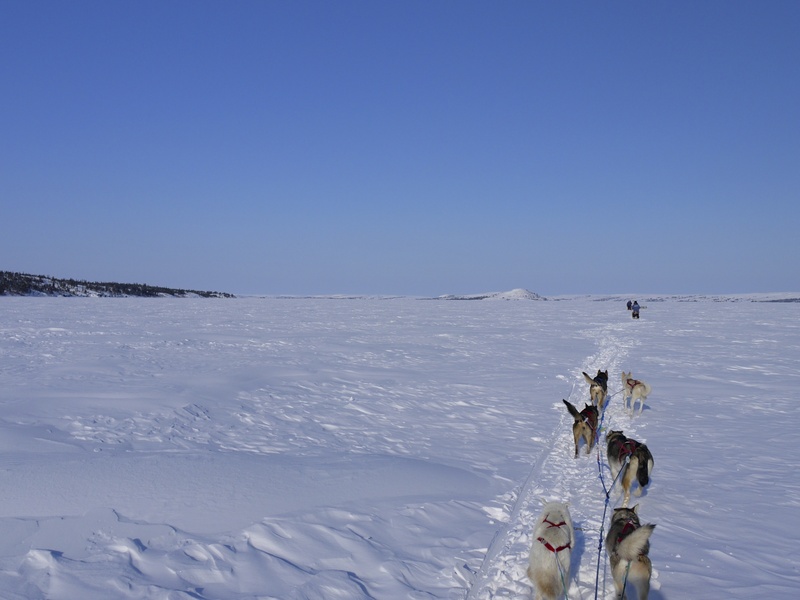 So, I felt like a real musher, and it was grand. 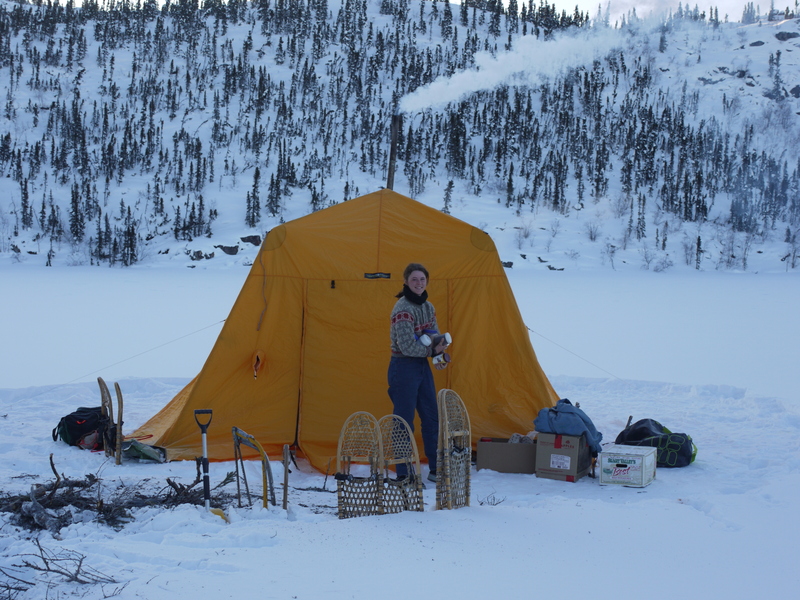 After a day of travel, with a lunch stop for hot sandwiches and hot drinks, ( more on the miracle of this later), we’d find a camp site near open water, usually as the sun was setting. Then we’d all get to work setting up our camp. This involved unharnessing and staking out the dogs, (and also lots of rubs and pats and noises of praise for them, which they loved), packing down the tent site with our snowshoes, cutting down 3 or 4 of the small standing dead trees for firewood, erecting our tent, the beloved Arctic Oven, (you can read my previous blog about this miracle here) getting the stove going inside, and then unpacking our gear. On top of this Dave and Annika, our guides, also collected fresh water, cooked dog food on a stove outside, fed the dogs, (their breakfast was put in a cooler and buried in the snow overnight, to keep it from freezing), cooked our dinner, made us tea, and filled our water bottles for the morning. (They started hot in the bottom of our sleeping bags so they wouldn’t freeze in the night.) It was a busy time, and without Dave’s help it would have been exhausting. (It was actually exhausting seeing how hard Dave worked to support the whole operation.) It made me realize that this is a trip I could potentially do on unsupported, (without a guide) but it would not at all be easy. 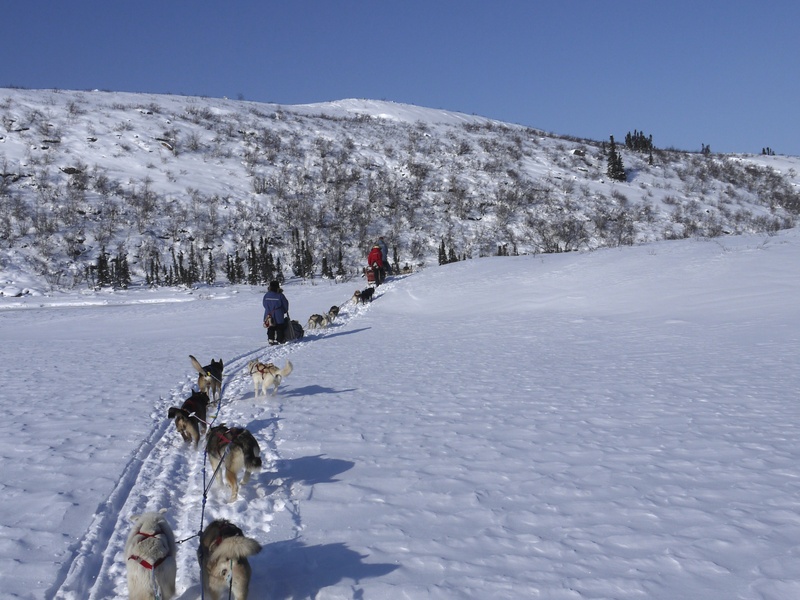 Dog sledding and winter camping is hard work – not so much hard exercise as just plain unfriendly on the body. Once the tent was up and warm, we’d retire for the night, drying out our wet clothing, visiting and exchanging stories. We slept on caribou skins provided by Dave and even though the tent was unheated overnight, we were warm and cozy in our down sleeping bags, with an over bag, and 3 sleeping pads under us. And camping on the snow is not like camping on hard ground – it was soft and comfortable! Once we in our bags, wearing down booties and long johns, toque and a sweater or two, with the mummy bag tightened up around our faces, and the over bag zipped up, the inevitable happened. The call of nature! I would put it off as long as I could, but I knew it was inevitable. 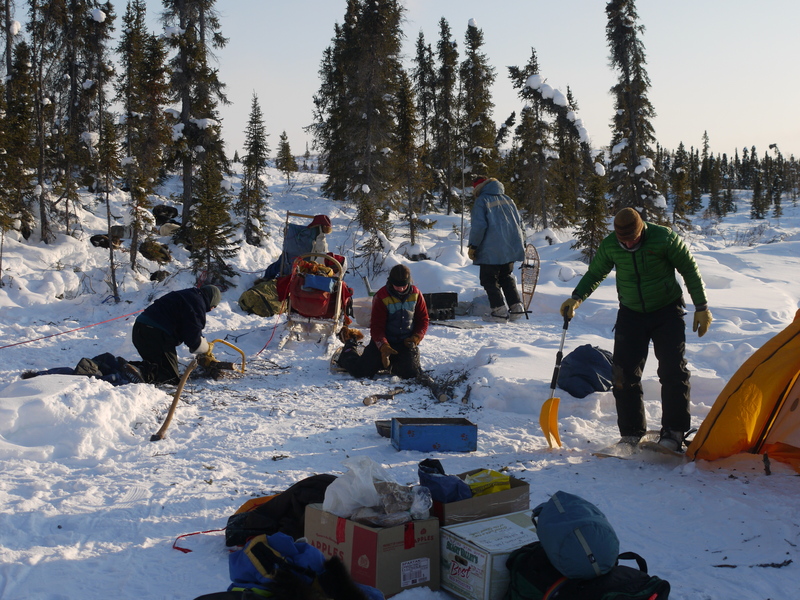 Eventually I’d have to excavate my way out of my nest of layers, cautiously tiptoe over a few sleeping bodies, in the dark, trying not to clatter into the stove or cookware, unzip the two doors to the tent, and step outside into the cold night, ( -37 degrees cold) for a quick pee. But, in the end it was entirely worthwhile as it was the best northern lights I’ve seen – the entire sky filled with green. Of course in my long johns I wasn’t about to start snapping photos with long exposure times, so you will just have to take my word for it. In the morning, amazing Dave would wake at 6, get the warming stove going, and put a pot of coffee on the cook stove. So we woke to hot coffee in bed. Gee, it isn’t all hard work! 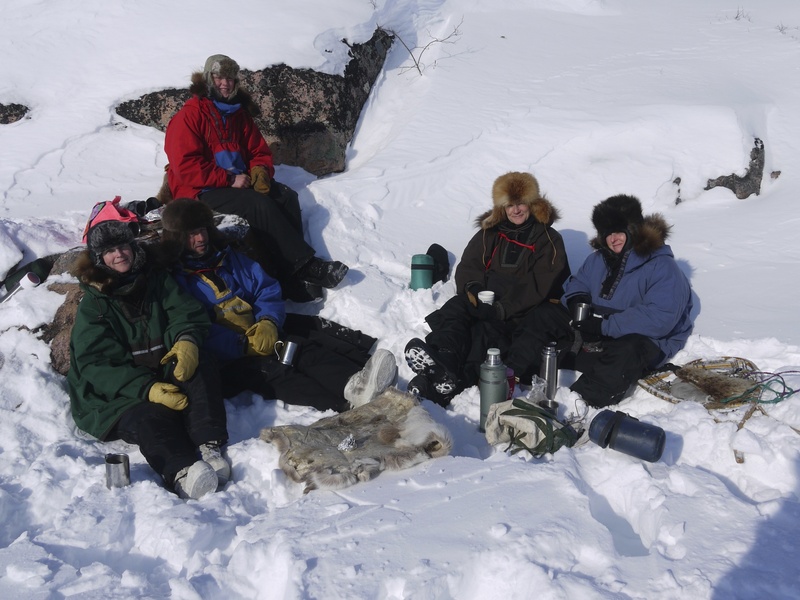 At this time Dave would put our pre-made lunch sandwiches, now frozen of course, under the warming stove, and when they were nice and hot, he would wrap them in a caribou skin. 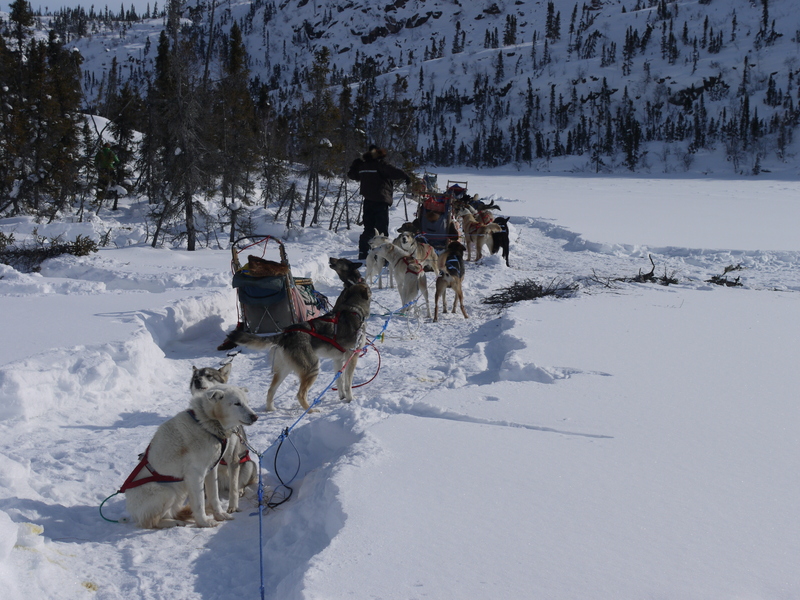 They would spend the morning in the dog sled, and at lunch, they would still be hot. Seriously – they were warm and the cheese still melted. 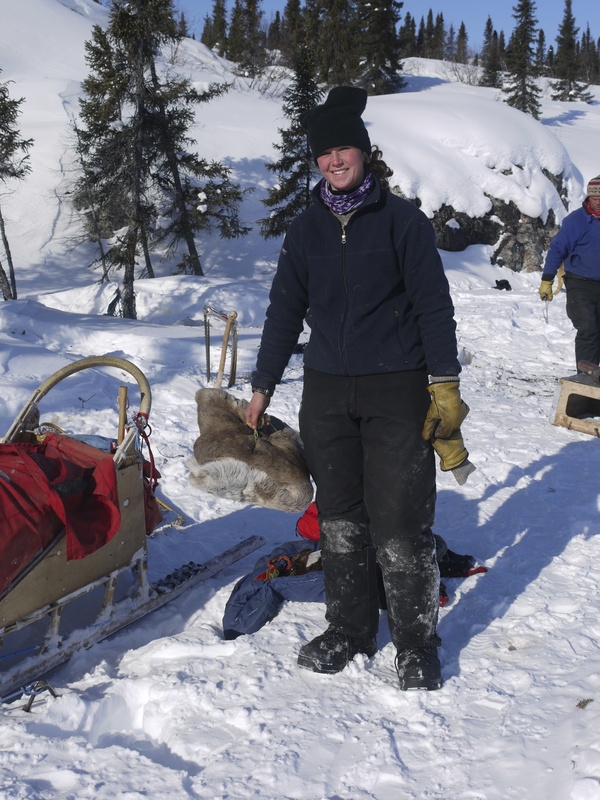 Can you imagine the heat retention of that caribou skin? It helps to understand how these amazing animals can withstand their daily living conditions. 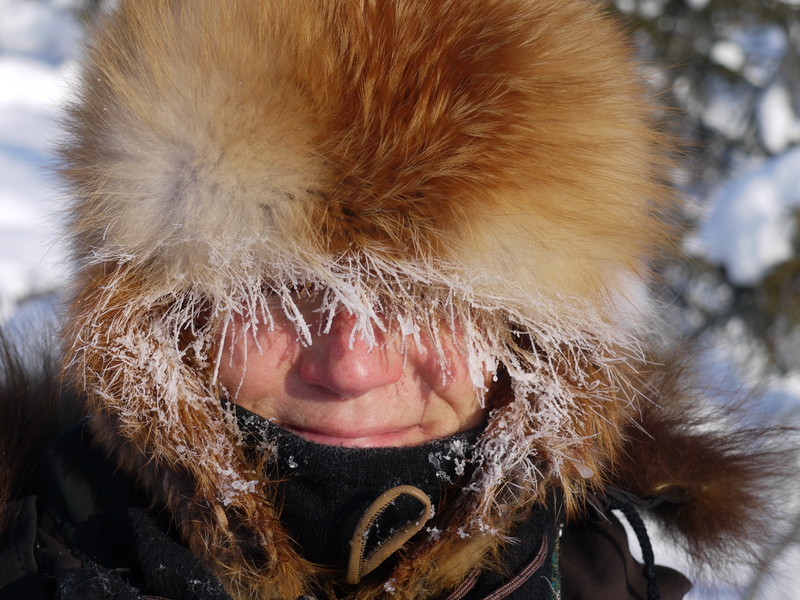 We experienced fairly cold temperatures on our trip – nights of -35 or so, and daytime temperatures of -20 as a high. And lots of cold headwinds. 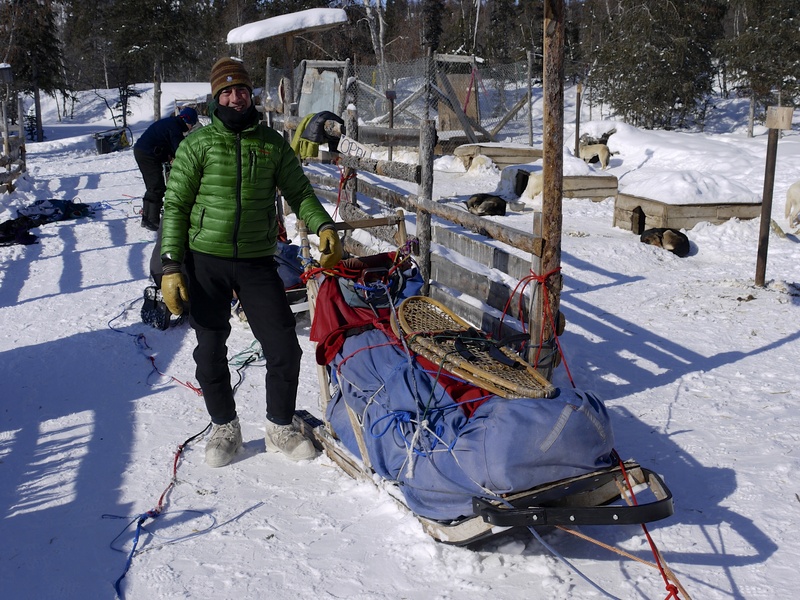 I know how to dress for these temperatures when I’m constantly moving, but standing on the back of a dogsled all day is something different. The Olesen’s provided us with wonderful loose fitting wind proof anoraks which were amazing. The big hood helped us regulate our temperatures. This was topped off with beaver and sheepskin huge overmitts, complete with harnesses to hang them around our torso so they were always handy, and the warmest boots in the world. I also wore my bulky down pants the whole time. I was mostly warm, but I was surprised at how much clothing was required. Between the bulky clothing, the choice between awkward snowshoes or falling into snow thigh deep, and the fun of getting tangled in the dogs’ lines and harnesses in their exuberance, I was reminded very much of how it felt to be stuffed into a snowsuit as a child, and be barely able to move. Still, the landscape, like the incredible frozen Bridal Veil Falls in this video, made it worth every second. 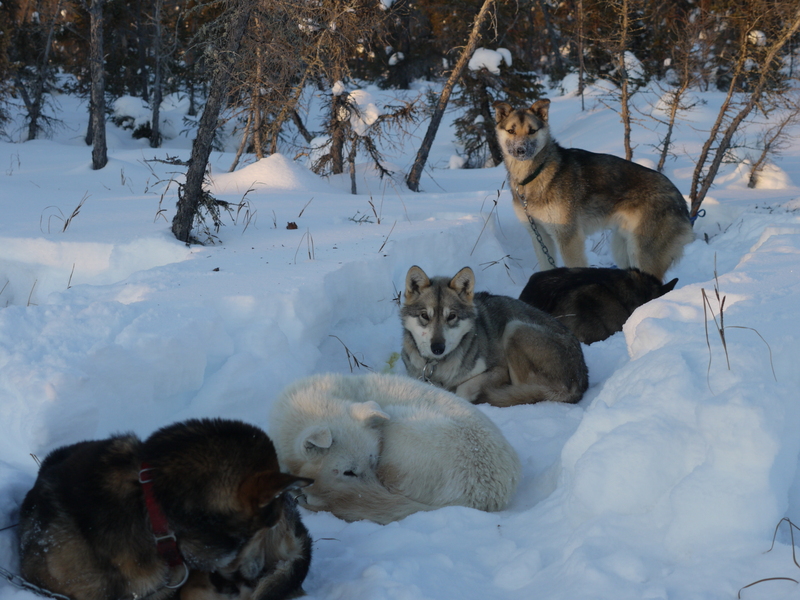 This entry was posted in North of 60, photos, video and tagged barrenlands, Caribou, Dave Olesen, Dogsled trip, Great Slave Lake, Hoarfrost River Huskies, sled dogs, The Arctic, wilderness, winter camping. Bookmark the permalink. I’ve elevated you in my mind to “Goddess of the North”. This is truly the most “extreme” sort of vacation I’ve ever read about. The beauty is there but I think you are incredibly daring! While I love the idea of actually being a Goddess of the North, honesty compels me to point out that I am in fact, just an ordinary girl, with a cheque book and a down coat. I am a neophyte compared to the old timers around here. I think the real Goddesses of the North are the Olesen women, Kristin, Annika and Liv, who have a lifetime of living such adventures. But thanks anyways! You know, while I read your posts, I find myself thinking, “I could do that. And yes, I could do even that.” However: at this point, I’m thinking, “No, I really could not do this!” My gracious, what an adventure. On the other hand, there’s a lot here that suggests lack of knowledge about how to prepare for such conditions skews judgment of what is and isn’t possible. Those caribou skins, for example. I never would imagine that food could be kept warm in those conditions. But of course, you’re not toting that food in a styrofoam cooler – even a high tech one. It’s a reminder, too, of the importance of real fur for warmth. Some Houston socialite sporting her mink at the symphony is one thing. Your fur mittens and fur-lined boots and such are something else entirely.